HomeBlog November 2016 A Family Tradition: Paint By Number! A Family Tradition: Paint By Number! Ever wonder who’s behind all the pretty colors of paint and formulas at Plaid? Carl Reichenbach has been the ringleader behind our paint team for the past nine years, managing brands like FolkArt, Apple Barrel and Delta Ceramcoat. Not only does he spend his days dreaming up new innovations with the team, he even packs his paint on family vacations! Read on for how Carl uses Plaid Creates Paint by Number as a family tradition and a fun way to connect with family! Q: How did you get the idea to start doing paint by number on family vacations and how many years have you been doing it? A: Ever since I've been with Plaid, I've brought some type of craft to do at the beach. "PBN's," as we like to call them, have just become a perennial favorite. We've done them for the last 6 years. Q: What makes Plaid’s Paint By Number Kits such a great activity for families? A: The designs appeal to a broad range of people. We have everyone from seniors to tweens participating and they love it. I usually bring 2-3 designs to choose from the for the week, and then let a lucky couple of family members take the extra designs to do on their own after the beach week. They're always calling me for more paint-by-number kits during the year. I bring lots of extra brushes so that several people can work on a canvas at one time. It can be a quiet-time activity with just one person working on their own or a real social time with several people painting and talking! Q: What do you do with the artwork after you’re done with them? A: I hang them all in my office. This is often a point of contention at the end of the week because they all want to take it home. But I supplied the kit, so I get to keep it (even if they did most of the work)! Q: What’s the favorite design you’ve done? A: My favorite design is the Cardinals & Cherry Blossoms design. Cardinals have always held a special place with our entire family. We all have memories of sitting in our grandparent's back yards in North Carolina and seeing the many cardinals feeding from their bird feeders. They were real bird lovers. The cardinals probably miss them almost as much as we do. 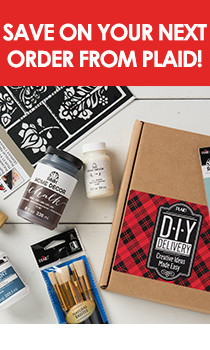 Have you tried Plaid Creates Paint by Number? Let us know in the comments, and tag your artwork #plaidcrafts to share with us on social!